The Chipper Mouse is a breed of mouse found in the Slushy Shoreline and Iceberg locations. It is known to drop a variety of loot. Chipper mice aren't as chipper as you might expect, given their names. Instead, they all seem to have a chip on their shoulder, and are bitter, spiteful fellows. Chippers work out their frustrations on the ice and rocks in front of them, making quick work of walls and carving tunnels faster than would seem otherwise possible. In fact, the only other activity that seems to give them solace is stealing hunters' supplies and hiding their ill-gotten goods in holes made slightly too small for human hands. The Chipper mouse has no specific preference for any kind of cheese. 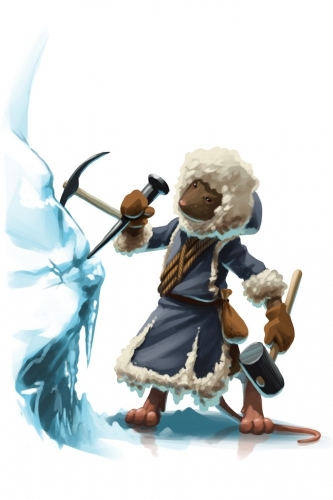 In the Slushy Shoreline, the Chipper mouse is known to drop War Scrap as loot. The Chipper mouse can be found in the Treacherous Tunnels, Bombing Run, and The Mad Depths zones of Iceberg. The encounter rate for the Chipper mouse can be increased by arming the Magnet base. Additionally, in The Mad Depths zone, the encounter rate can be increased by arming the Hearthstone base. The Chipper mouse drops Frozen Sealed Bottle, Hunting Research, Satchel of Gold, Sticky Charms, and Wax Charms in the Iceberg location. The Chipper Mouse drops the Slushy Shoreline Egg during the annual Spring Egg Hunt. 7 May 2012: The Chipper mouse was released for the first time. The Chipper mouse dropped War Supplies as loot for the first week after its release. The Chipper mouse dropped Interlocking Hull Fragments between 14 May 2012 and 24 May 2012. 1 June 2012: The Chipper mouse began to drop loot in the Iceberg location. This page was last edited on 17 October 2017, at 20:11.